Dears, Now that you’ve read my Astrology Column I wanted to share my marvelous wisdom with you….Uranus has been playing hide and seek with Mars this month while Pluto has triangulated with Venus which will wreck havoc on people’s digestive enzymes for the next few weeks. I always try to lower the acidic levels by eating vegetables in creative fun ways. Try my stuffed mushroom recipe for a real treat. Rinse, mushrooms and remove stems, reserve caps. Chop stems and cook with onions and garlic in butter until tender. Stir in bread crumbs and cheese. Spoon mixture into mushroom caps and arrange in dish and bake 425 degree oven for 10 minutes. **You can even add those left over cooked veges to add extra flavor and utilize those left overs. Quinoa Milk great for Pesach! Place the uncooked quinoa in a fine-mesh seive and wash, wash, wash it. Why? Quinoa seeds have a bitter coating called saponin that you want to wash off.). Put the washed quinoa into a glass container with a lid. Cover the seeds with water, put the lid on it, pop it in the fridge overnight. The next morning, pour the soaked quinoa into a seive and wash it again. Put the quinoa into a pot with 2 cups fresh water (not the water it soaked in) and a pinch of salt. Bring it to a boil, covered. Turn the heat down and simmer the quinoa (covered) until all the water is absorbed, about 20 minutes. place the cooked quinoa in a blender with 2 more cups of water. Blend on high for 1 mkinute, then add water until the milk reaches your desired consistency. You would add any desired sweeteners and flavorings at this point. Strain the quinoa milk through a fine cheesecloth (a clean napkin will do) into a bowl. Note that, even with the straining, there will still be flecks of quinoa in the milk. These will settle out later, so don’t worry. Pour the quinoa milk into a clean quart-size jar, and stick it in thew fridge to cool. Note that the milk may seperate a little. This is okay. Just give it a little stir. The milk will keep about a week, unless you freeze it (I guess you could freeze it? I’ve never tried.). Steps: no need to soak hemp seeds, just blend together and strain through cheesecloth, although this is an optional step since they blend up nicely. Serve chilled or room temp. Store hemp seed in the fridge or freezer, they are loaded with fragile essential fatty acids and can go rancid easily. Taste/consistency: looks a tad like a sesame seed and has a delicious, buttery, nutty flavor similar to that of a pine nut or sunflower seed. Very creamy, unique, pale green milk. Add-ins: 1/4 tsp vanilla extract, 2 tsp raw wild-harvested honey or grade B maple syrup and pinch of fine ground sea salt. Make it fancy: add cardamom and cocoa. Mixed berries blended in alone, or with cocoa and maple syrup are divine options as well. I love this milk blended with blueberries. Nutritional bennies: hemp protein contains all 21 known amino acids (complete protein), including the 9 essential ones that adult bodies cannot produce. Hemp seeds are considered by leading researchers and medical doctors, to be one of the most nutritious food sources on the planet. Shelled hemp seed is 33% pure digestible protein and rich in iron and vitamin E (3x the amount in flax) as well as omega-3 and GLA. Soak the nuts: Place the nuts in a medium bowl. Cover with about 1 inch of water. Cover the bowl with a cloth and let sit overnight at room temperature or for up to 2 days in the refrigerator. The nuts will plump as they absorb water and should feel a little squishy if you pinch them. The longer the nuts soak, the creamier the milk will be. Drain and rinse the nuts: Drain the nuts through a fine-mesh strainer or colander, then rinse them thoroughly under cool running water. Combine the cashews and water in a blender: Place the nuts in a blender (or a food processor) and add the 2 cups of water. Strain out the nut meal: Line the fine-mesh strainer or colander with either an opened nut bag or 2 layers of cheesecloth and set over a measuring cup (or bowl if you don’t have one big enough). Pour the nut mixture through the strainer. Gather the nut bag or cheesecloth around the nut meal and twist close. Squeeze and press with clean hands to extract as much nut milk as possible. You should get about 2 cups. Sweeten to taste: Taste the nut milk, and if a sweeter drink is desired, add sweetener to taste. Refrigerate the nut milk: Store the nut milk in sealed containers in the refrigerator for up to 4 days. Save the nut meal for another use. Storage: Leftover nut milk can be stored in an airtight container in the refrigerator for up to 4 days. If it separates, just shake to recombine. This 2 ingredient raw cashew milk is my all time favorite plant milk. It’s really creamy, easy to make and cheaper than store bought. Soak the cashews in water overnight (optional). Drain the cashews and blend them with the water until well blended and almost smooth. Strain the milk using a cheesecloth or a strainer. You can use a napkin too. Store the cashew milk in a sealed container in the fridge for 2 or 3 days. The diet is based on rice, every three days adding a new food category, for instance, after the first three days of unsalted rice and clear pure lots of water, the addition of turmeric, cumin, parsley, fenugreek, spices, herbs, especially green, olive oil and lemon are all permissible after 3 days. So the “fast” is not so difficult. GREAT for high blood pressure, and GREAT for allergies and rhinitis. 1st 3 days: We eat only rice (brown recommended)., boiled in water, preferably with no salt, if necessary, then scant. Lemon is fine. Make sure to drink at least 8-10 glasses water daily. After first 3 Days, may use spices such as turmeric, cumin, cinnamon, sweet paprika, muscat, ginger, also garlic and onion. The 2nd 3 days: Add GREEN vegetables. Rice plus: cucumbers, lettuce, beet greens, baby leaves, spinach, parsley, coriander, fennel, celery, zucchini, green beans. 4th set of three days: Add ROOT vegetables. Rice plus: Greens, Orange, Root vegetables (herbs and spices, olive oil, plenty of lemon juice before serving all along). Roots such as: Kohlrabi, Beets, Parsley root, Celery root. 5th set of three days: Rice, Green vegetables, Orange and Root vegetables, add Cereals such as: Buckwheat, Barley, Oatmeal, Millet (NOT Wheat). 6th set of three days: Rice plus LEGUMES/BEANS – All Kinds: Azouki, Choumus, Lentils, Mush, plus GREEN, ORANGE and ROOT Vegetables. 7th set of three days: Add, Seeds (Pumpkin, Sunflower, Sesame), Nuts (Almonds, Brazil, Cashews, Pecans, Walnuts), Fish 3X weekly. Recipes and ideas for this 3-week, easy, Rice Cleansing Diet, to come (hopefully). When it comes to spending time together, fruits and vegetables are surprisingly human-like. It seems the real secret to keeping them at their freshest for as long as possible is simply knowing where they like to spend their time and which fruits and veggies get along best. You can take advantage of this if you want to speed up the ripening process. Put an apple in a bag with an unripe avocado, or a peach in a closed paper bag with a ripe banana. But if you want your already-ripe foods to last longer, keep them away from ethylene-producing foods. Store cold-sensitive fruits and veggies on the counter, not in the fridge since lose flavor and moisture at low temperatures. Once they’re fully ripe, you can refrigerate them to help them last, but for best flavor, return them to room temp. Never refrigerate potatoes, onions, winter squash or garlic. Keep them in a cool, dark, dry cabinet, and they can last up to a month or more. But separate them so their flavors and smells don’t migrate. And remember: One bad apple really can spoil the whole bunch. Mold spreads rapidly and contaminates everything nearby, so toss any spoiled produce immediately. For longer life, keep your produce whole –don’t even rip the stem out of an apple until you eat it. We love how this quick-reference chart from sparkpeople.com puts it all in order. Auntie’s Note: An easy way to do macaroni and cheese when there is little time until dinner. No baking required. 2) In medium saucepan, melt butter over medium heat; stir in flour, salt and pepper; slowly add milk. 3) Cook and stir until bubbly. 4) Stir in cheese until melted. 5) Drain macaroni; add to cheese sauce; stir to coat. What’s considered the most respected newspaper in the world today published the Kraft warning label that a Food Babe reader found in the UK on an imported US box of Kraft Macaroni & Cheese. I want to thank the NY Times for investigating and broadcasting this label to the world and millions of Americans in their newspaper and online for everyone to see. This is a huge victory in food awareness! The NY Times verified that this is in fact a real label on US Kraft Mac & Cheese sold in the UK. Kraft customer service confirmed use of other GMOs in their products (see video evidence here). Given all the public statements that Kraft has made to the media about this label so far – they have not attempted to refute one important fact – Their product “May Cause Adverse Effects On Activity And Attention In Children.” This is truth they can’t deny. Tesco who sells the US version of Kraft Mac & Cheese in their “World Foods” section confirmed the label is placed on by the distributor – Innovative Bites. The case is still not solved. THERE IS STILL A MAJOR QUESTION UNANSWERED. No one has been able to get in touch with distributor Innovative Bites (including me) to find out why they used the words “made with genetically modified wheat” on the label. Lynne Galia, the spokeswoman I met at Kraft headquarters when I delivered thousands of signatures, has still not responded to me directly. She will not answer my emails or my phone calls. She will gladly talk to the NY Times and other news agencies, but not to me or the other 290,000 people I represent who signed a petition asking Kraft to remove artificial food dyes. I find it bizarre that Kraft wouldn’t genuinely want to answer basic questions about their product – especially after I posted this concerning information that could have health implications to millions of people and children. How can we continue to trust a company like Kraft that is more concerned about making greedy business decisions to keep their market share and paying their executives millions of more dollars year after year, while neglecting enormous public outcry regarding their flagship product? How can we continue to trust a company that continues to not take responsibility for their product containing petroleum based dyes and GMOs? How can we continue to trust an American company that reformulates their products without harmful ingredients to our friends overseas but not to us? First wash the fish and then try to put the fish in the middle, face down and then face up – tail down. Eventually it defrosted and bent and then when soft I cut the head and tail off and was able to continue cooking it in small amount of oil with paprika, cumin, caraway seeds and a splash of tomato paste in the pot. It cooked and tasted great, I also placed gefilta fish in the extra sauce and that came out good as well. Better than just out of the jar. First wash the fish and then try to put the fish in the middle, face down and then face up – tail down. Shakshouka:Shakshouka, from the Hebrew word leshakshek meaning “to shake”, is a popular, spiced, egg and tomato dish. 1. Heat the olive oil in a skillet over medium heat. Stir in the onion, bell peppers, and garlic; cook and stir until the vegetables have softened and the onion has turned translucent, about 5 minutes. 2. Combine the tomatoes, cumin, paprika, salt, and chile pepper into a bowl and mix briefly. Pour the tomato mixture into the skillet, and stir to combine. 3. Simmer, uncovered, until the tomato juices have cooked off, about 10 minutes. Make four indentations in the tomato mixture for the eggs. Crack the eggs into the indentations. Cover the skillet and let the eggs cook until they’re firm but not dry, about 5 minutes. Mix the dry ingredients in a big bowl. Mix wet ingredients in a smaller bowl. Then stir in the wet ingredients with the dry and roll it into a dough, kneed it nicely and then put inside oiled bowl, cover and place in warm place to rest for about an hour. 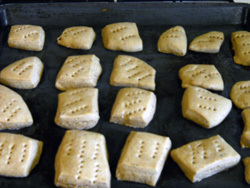 Kneed dough and roll out into squares. Place on greased cookie sheet at 350 degrees or 170 C, and cook for about 10 to 15 minutes. And you have gone crackers! 1. Mix all ingredients except for peanut butter through a meat grinder. 3. Roll out into 1/2 inch thick sheets. 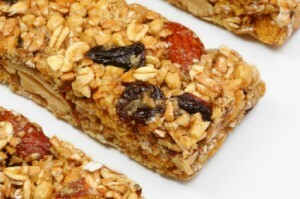 This homemade energy bar recipe is chock full of goodies and will sustain even the most exhausted trekker through the trip home. Wrap them individually and make extras for tucking into BOB (Bug Out Bags) or GHB (Get Home Bags) backpacks. Made to fill you up and give you lots of nutrition at the same time. Grab a couple bars on the go when you have to miss a meal, or use as a snack to help keep your weight up if exercising a lot, pregnant or nursing, or otherwise find it hard to keep on weight. Feel free to alter the recipe to suit your needs. Aren’t the best tasting recipe but designed to be filling and provide lots of omega 3’s, protein, and calories along with other nutrient dense ingredients. You can also make these into cookies or muffins if you prefer instead of making bars. After 15 mins of baking you can turn off the oven and just leave them in the oven until they reach desired hardness as well. Preheat oven to 350. Grease two baking sheets with some of the olive oil and then put the remainder in the dough. Mix all moist ingredients and all dry ingredients separately then combine. Put half of the dough on one cookie sheet and press it flat to fill one half side of the pan. Do the same with the other sheet and remainder of dough. Bake at 350 for 10 – 15 mins and cut apart into bars. Space apart on cookie sheets and bake until they reach desired hardness. Store in freezer and use as a quick meal or to help maintain / gain weight from time to time. Recipe submitted by SparkPeople user NATURENUT1233. Cook the quinoa according to the directions on the package (takes about 15-20 minutes). You’ll need 2 cups of water for 1 cup of uncooked quinoa. Allow it to cool before moving forward. Combine the cooked & cooled quinoa, oats, chocolate chips, and flaxseed in a bowl and mix to combine. Add in the peanut butter, milk, and honey and stir to combine. *TIP* Spray the 1/4 cup with non-stick cooking spray before measuring the honey, it will ensure that it doesn’t stick to the cup. Spray an 8×8 inch baking pan with non-stick cooking spray. Transfer the quinoa mixture to the baking pan and distribute evenly with a spatula. Bake for 21-26 minutes. Remove the pan from the oven and allow the bars to cool. Cut and store in an airtight container in the fridge. Chop the two cups of peanuts in the food processor until they look like mine below. Consistency should range from sand-like to pea-sized. Pour the peanuts into a bowl and put the cranberries and dates into the processor. Run these together until a thick paste forms. Put everything together in a bowl and mix evenly by hand. Line your loaf pan with wax paper and spread the mix evenly on top. Add a second sheet of wax paper on top and press mixture into the bottom of the pan by hand or with some kind of roller. The tighter you can pack to down, the better your final product will hold together. Once pressed hard and tight, the mix will keep its shape. Take it out of the pan and lay it in the freezer for 30-45 minutes to harden. Once hardened in the freezer, take it out and cut into bars. By weighing and adding up the calories of the entire batch, you can cut your bars to any desired per-piece calories by weighing them out. Wrap individually with saran wrap and you’re done. Store them in the freezer, fridge, or wherever you want. They’ll last a few weeks unrefrigerated, and much longer if frozen. Now let’s look a little deeper into what we just made, and compare it to what we would usually buy at the store. Mix dough and put in frig for one hour. Roll out and cut in circles and fold up into triangle with jam as filling. Traditional |Hamantashens have poppy seed filling or prune. Bake at 350 degrees for about 15 minutes. Dough: Dissolve the yeast in the water with a drop of the sugar. smooth dough. Cover and allow to rise for 1 hour. Topping: Mix by hand to form crumbs. over the dough. Roll up jelly roll style and pinch the ends closed. Fold the roll in half and twist 3 times. Transfer to loaf pan. Brush with beaten egg. Sprinkle the streusel over the entire roll. Add dry ingredients together with wet ingredients very slowly, if you put under beater it will spray your face. Bake at 350 degrees F for 10 to 15 minutes. This recipe is from my Great Grandmother,Kibbitz, who thought leftovers were so very useful indeed! or a few pieces of chicken like wings, neck, back. minutes and serve for dinner. Auntie Nosebag wishes everyone a good year and a sweet year on Rosh Hashanah. longer, adding a little water if necessary. Serves 6 to 8.
the longer and longer and longer they soak and you change the water and change the water and change the water the less gas you will experience afterwards. If using soy nuggets, presoak them in water ,soy sauce and cumin and squeeze after 10 minutes. Cut up peppers and remove seeds and white veins and put aside. Chop all onions up and keep separate. Cook onions in oil till golden and add soy nuggets or meat and brown. If you decide to use soy nuggets you know it tastes just like meat! Then add all the peppers and tomatoes and you get a nice blend. If you want to sicken everyone in the house brown the hot peppers in a bit of oil and watch everyone start coughing but if not just put them in the pot and close the lid. Oh no just kidden folks don’t do that it will make everyone start coughing and you’ll have to open all the windows. Let this cook and when after you slow cook this for several hours you can add the cumin, cilantro, tehina paste and paprikas and stir for another half hour. These chili can improve with age if you keep it going and makes a great alternative to Cholant. With all the news about Norway, I thought we needed some Norwegian Smorgasbord recipes. This one is so easy to make as well, enjoy darlings. *note that you could use the smaller jar of jelly instead, I think it’s more like 10oz. I like the sweetness of the 18oz jar, but you could make it less sweet with the small jar if you prefer. Combine jelly and chili sauce in a crock pot an stir until smooth. Heat the mixture if needed to combine. Add meatballs or cocktail sausages and set temperature to low. Cook for 2-5 hours on low. Serve with toothpicks. If you want more information about the new Nazi Hitler Youth school uniforms that Auntie Nosebag wears, Click Here!If you want to save yourself and your family from the new Nazi Hitler Youth and the Boycott Divestment & Sanctions(BDS) of Jews and Israel, Click Here! Darlings, my therapist suggested toning things down so I’ve decided to have a new look as well. In order to help improve my popularity I’ve decided to purchase a new Christian Dior outfit and perfume! Don’t you just love it! Crumpets are so British, and the world seems to be watching England lately, and what’s tea time without English Crumpets, so here they are. Combine water, yeast and sugar. Let stand until bubbly, about 5 minutes. Heat milk, 1 tablespoon of the butter and salt in a saucepan over low heat just until warm. Add to yeast mixture. Add 1 cup flour to yeast mixture and beat until smooth, about 2 minutes on medium speed of mixer. Beat in egg. Add remaining flour and beat until smooth. Cover batter with plastic wrap and let rise in a warm place until doubled in bulk, about 1 hour. Stir down batter and let rest for 5 minutes. Meanwhile, melt remaining butter in a saucepan over low heat. Skim off foam and discard milky solids from bottom of saucepan. Brush bottom of a skillet with melted butter. Brush insides of four crumpet rings or 3-inch round cookie cutters with butter and place rings in skillet. Heat skillet over medium heat. Spoon about 2 tablespoons batter into each ring. Cook until batter begins to bubble on top and is lightly browned on bottom, about 2 minutes. Remove rings. Turn English Crumpets over. Cook until lightly browned on bottom and done in centers. Can be served warm or split and toasted before serving. From Wikipedia, the free encyclopediaIn October 1996, LVMH moved Galliano to Christian Dior, replacing Italian designer Gianfranco Ferré. On 1 March 2011, Dior announced that it had begun procedures of dismissal for Galliano, with Dior’s chief executive Sidney Toledano stating, “I very firmly condemn what was said by John Galliano”. Galliano denied the allegations through his attorney, and launched a defamation lawsuit against the couple accusing him of antisemitism. Various rumours have also surfaced stating that he was set up. “From the very first day of Fashion Week, many editors have been saying that Dior wanted to get rid of him and that a plot like this would save it from having to pay him a reported £17 million”, said Marcellous L. Jones, editor-in-chief of fashion web magazine TheFashionInsider.com. Dior announced it will continue to support the Galliano brand financially due to license despite his previous scandal involving alleged anti-semitic remarks. On 8 September 2011, he was found guilty of making anti-Semitic remarks. John Galliano has been sentenced to pay a total of €6,000 (US$8,400) in suspended fines after a French court found him guilty of giving public insults on account of race.